After decades of dedicated service to not only the world, but to sitting presidents since Truman and Eisenhower, The Rev. Billy Graham decided that he does not want to serve in this role any longer. How ironic is this? Generally speaking I would give Graham the benefit of the doubt. After all he has done great work around the world and has preached to more people than anyone in the history of the world from what I know. His crusades have circled the globe many times over and his gentleman’s approach to evangelizing the gospel is digestible to even babies. He just turned 90 and his health can’t be as good as it once was. 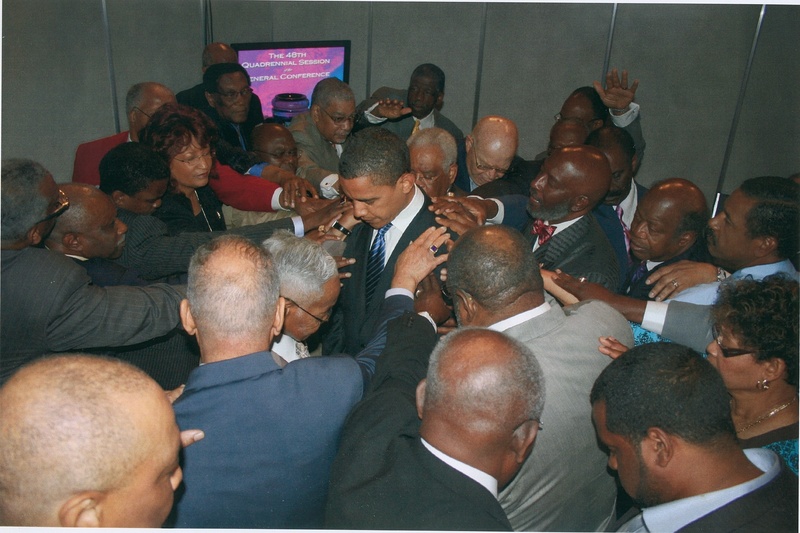 What I question however in terms of his work with presidents, is that while he has been there to pray and counsel these world leaders he has not always stood on the side of righteousness. With President Nixon he, not only supported a man who promoted the Southern Stategy of disenfranchising African-American voters, he himself spewed his own anti-semitic views while speaking with Nixon. These comments were a part of the Nixon Tapes released some years later. In addition, if one is to follow the bible in terms of being a prophet who has access to kings and world changers, the calling is not merely to pray but to speak righteously as the mouth of God in terms of a moral compass. With Nixon we know for sure that he spoke the opposite by disparaging a people. In addition when we think of the W terms, with the lies of the War in Iraq with it’s killings of innocent Iraqi citizens, the failure to equip soldiers and care for them at places like Walter Reed, the debacle of Hurricane Katrina which killed many and displaced thousands of families, to the white collar criminals like Scooter Libby and Bush’s pardons of such criminals, Graham did not find it in his heart to take these things to task. In biblical history, when God used a man to speak to leaders, he was sent to proclaim the truth not to merely be the president’s friend. Take Moses for instance. He wasn’t cozening up to Pharaoh. Instead he told the wicked leader time and time again that God said to, “Let my people go,” less God’s judgment fall upon Pharaoh’s land. (Book of Exodus) Nathan the prophet didn’t pat King David on the back when he has Uriah killed because he was trying to cover up the fact that he impregnated Uriah’s wife. (2 Samuel 12) Nathan told David straight up he was tripping! Graham’s silence or acquiesce over the years from Vietnam to Iraq has no such implications. He like many preachers are more flattered to be in the presense of presidents than they are about the calling and purpose for which God wanted them access in the first place. And yet as Graham’s son Franklin (the most vocal right winged conservative of the family) noted he is perfectly fine with publically taking Obama to task for his views on abortion and gay marriage. So of all the injustices done by men in the White House over the years, Graham decides within two days of President Obama being elected – the first black president – that his work with presidents is over. But according to Franklin, the elder Graham wants to “meet and pray with Obama.” What is that some kind of token concession? Pray about what? That Obama changes his views on gay marriage and abortion? Graham did say by the way that he hopes God moves on Obama’s heart to change his views. Funny he didn’t want God to change W’s heart on anything of the last 8 years. Oh please spare me! That’s OK Bill and Franklin.. F’ it! I am pretty sure Rev. Jeremiah Wright’s phone number hasn’t changed. For real though… as far as prayer goes, I think we’ve got it covered. This entry was posted in Philosophy, Political, politics, Truth Seeking and tagged Abortion Rights, African American Episcopal, AME, America's President, Barack Obama, Billy Graham, Franklin Graham, Gay Marriage, Rev. Jeremiah Wright. Growing up in North Carolina, riding on the Billy Graham Parkway, this news really saddens me. … But what else is there? Graham’s son has all kinds of excuses as to why his dad is unwilling/unable to fulfill this role for Barack Obama- a role that has become traditional, something Billy Graham has been involved with for many years… but none of the reasons hold any weight. If his age was the driving force behind this, why not announce it while both candidates were still running? Why not tell both the McCain and Obama camps that regardless of who wins, he will not be a part of the equation this time? If Obama’s “liberal” stance on abortion and gay rights truly had anything to do with his decision, why then, did he not stay away from the Clintons? Obama, surely, is not the first person to hold office with pro-choice views. Billy Graham couldn’t bring himself, man of God though he may be, to support the presidency of a black man. Sad as it is, it really is just that simple. Ahhhhh let the lovely people of America, who voted Obama into his most deserved spot as president, all breath a sigh of relief and speak a soul felt Amen. As we notice that even without the support of the (LOL) wonderful Billy G, Obama still remains our country’s president and will continue, thank you very much, for no less then then next 4 years.